Photo is thought to have been taken about 1910. 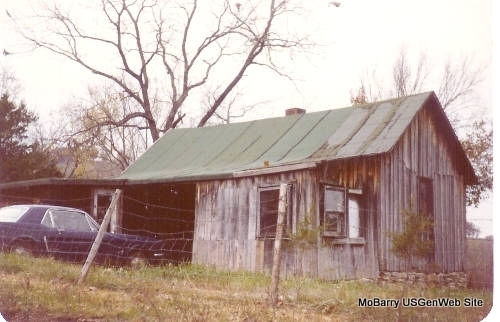 Jamie Mooney had a grocery store in Washburn for many years. 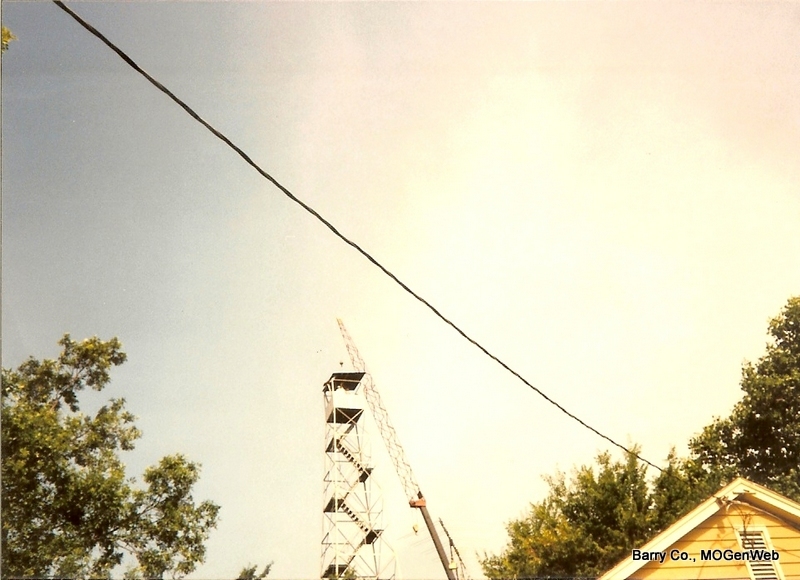 It is speculated that this photo was taken in 1910 and standing with one hand on the pole is Jamie Mooney. 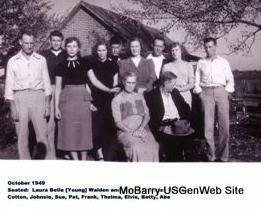 The four children pictured are the Mooney children - Loyd, Harold, Lena and Helen. 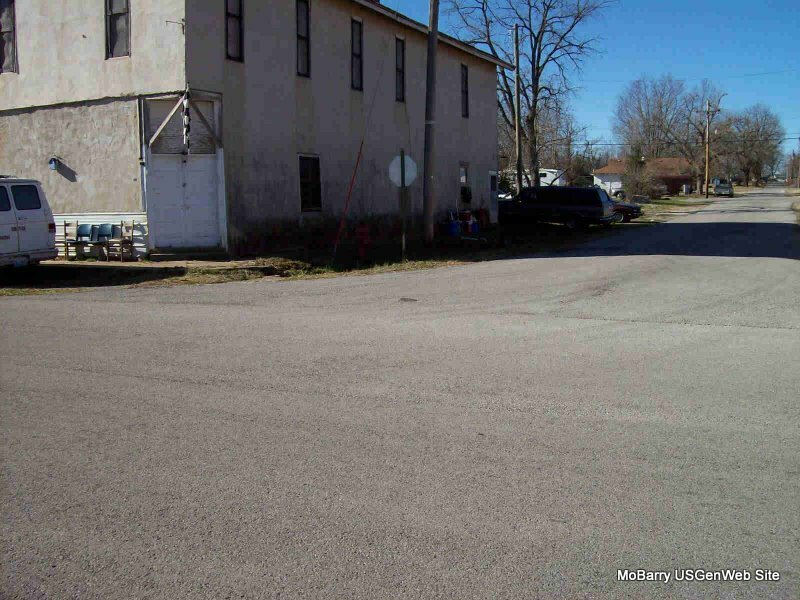 The store they are standing in front of is the Mooney Grocery Store, sometimes referred to as the Mooney Produce in the Barry County newspapers. Research Note: James Harvey Simpson Mooney 's adoptive father was an Irishman, Timothy Patrick Mooney. Jamie was a brother to John Simpson and his death certificate listed his parents as American Simpson and George Simpson. This information matches with the information that Jamie told his family. He said that George Simpson was his father and that John Simpson was his brother. John Simpson was born in Eagle Rock, MO, and Jamie, his brother was born in Washington, MO. The DNA for George Simpson's great grandson and America Simpson's family proves that she and George Simpson were not related. Both were living in Barry County, MO. Some more history concerning, America Melinda Simpson is that she was a daughter of William Hamilton and Louisa (Bristow) Simpson. 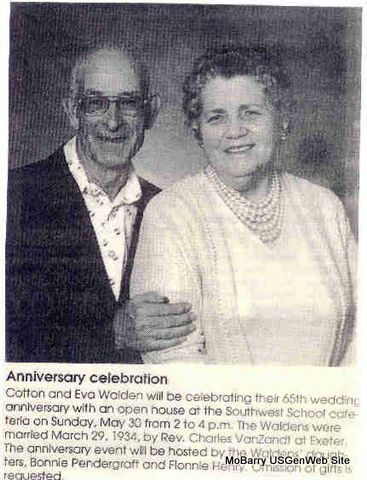 After George Simpson, she married John Wilkerson and Elijah Bailey. Louisa, America's mother married William Simpson, Alfred Reed and Solomon Allred and she is buried in Madison Co., AR, in Watson Cemetery. 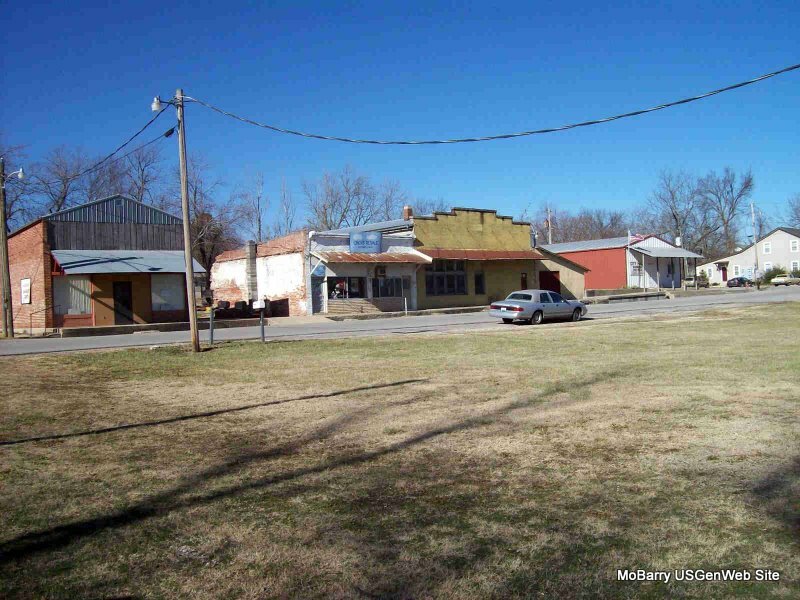 America is thought to be buried in LeFlore Co., OK, near her brother, William Green Simpson. Alfred Reed died in 1880 and is buried in Reed Cemetery, near Roaring River. 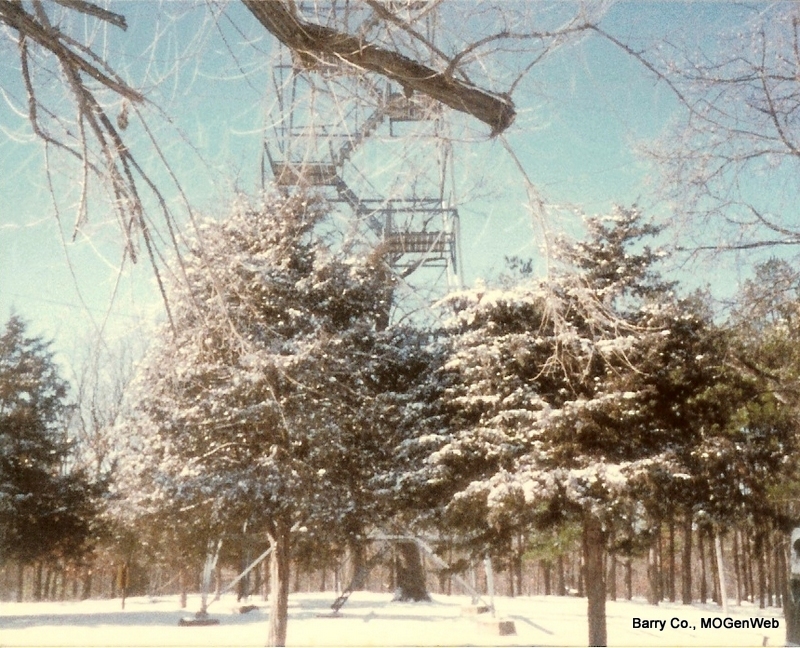 This post card is displaying the new electric pole that Washburn is so proud of in 1910. 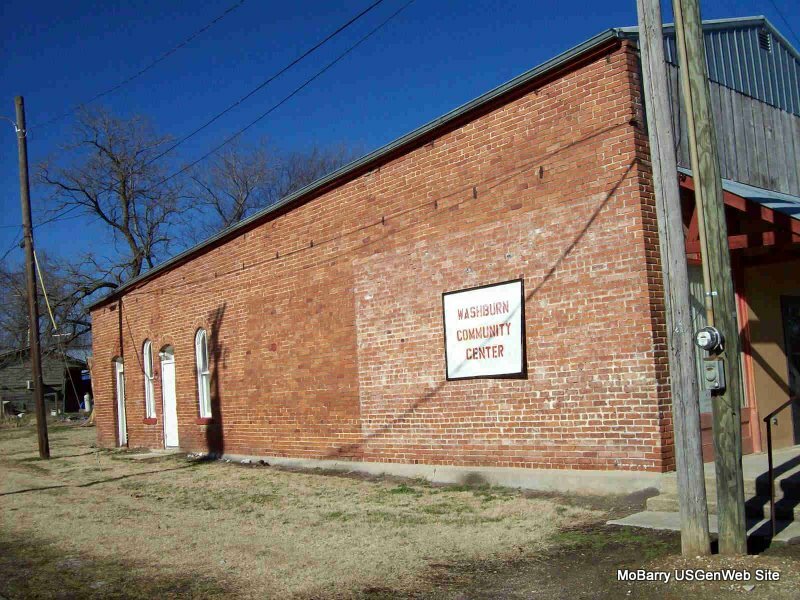 W. B. Adcock's building is now the community building and is one of the few buildings left in Washburn today. The post office is on the south side of the building where the 3 windows and door are. 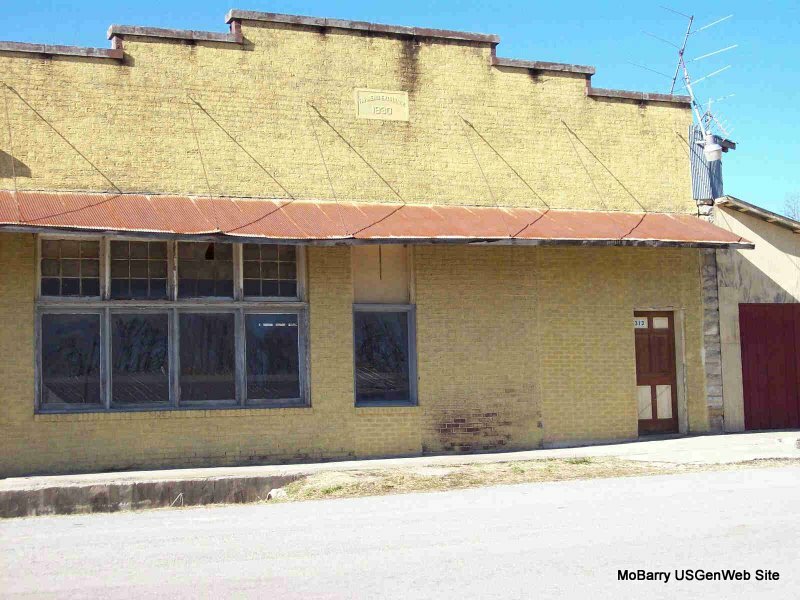 Mooney Store in Washburn, building was later the post office. 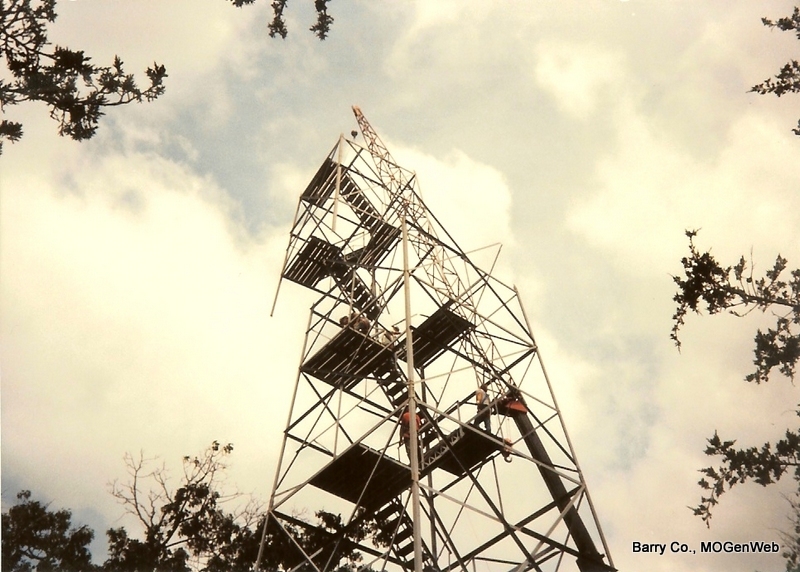 Probably Jamie Mooney on the ladder. 16 June 1881, Neosho Times - Robbery at Washburn, Mo. 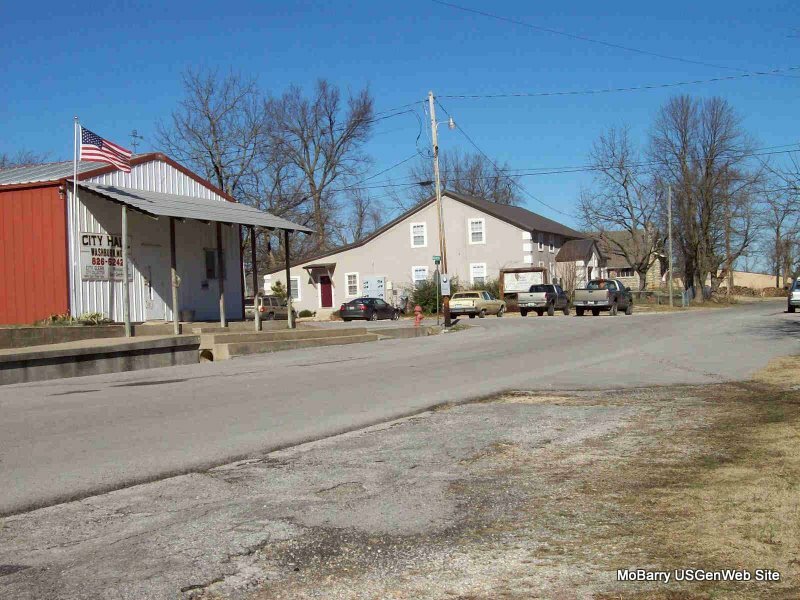 - A dispatch to the St. Louis Republican says the dry goods store of W. K.Bayliss, at Washburn, Barry County, Mo., was broken into at an early hour on the morning of June 9th and the burglars succeeded in blowing open a safe, in which they found $2,000. They then broke into E. J. 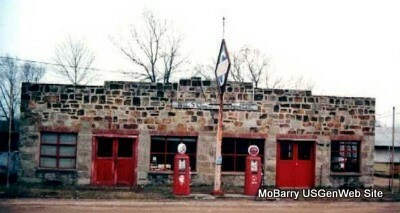 (should read T. P.) Mooney's store, in which is also located the post- office. The thieves here found $1,000 worth of stamps, mostly threes, and stole the entire lot. No one was sleeping in the place at the time, and the burglars had every opportunity to carry out their thievish designs. Six hundred dollars of the money stolen was in gold, mostly $20 pieces. A considerable portion of the amount lost is said to belong toother parties than Mr. Bayliss, in whose hands the funds were placed for safe keeping. 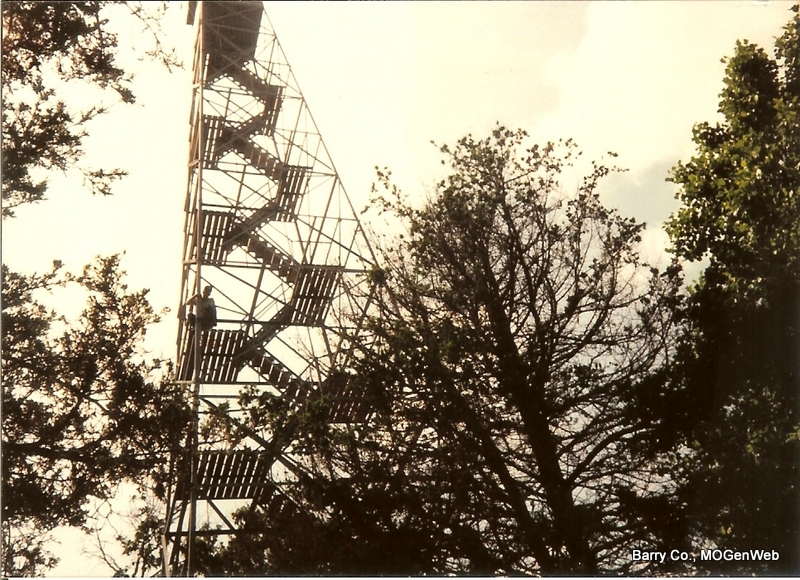 Soon after the discovery of the robbery was made, two men were seen hurrying in the direction of Eureka Springs. The officers are in pursuit, and every effort will be made to catch the rascals. 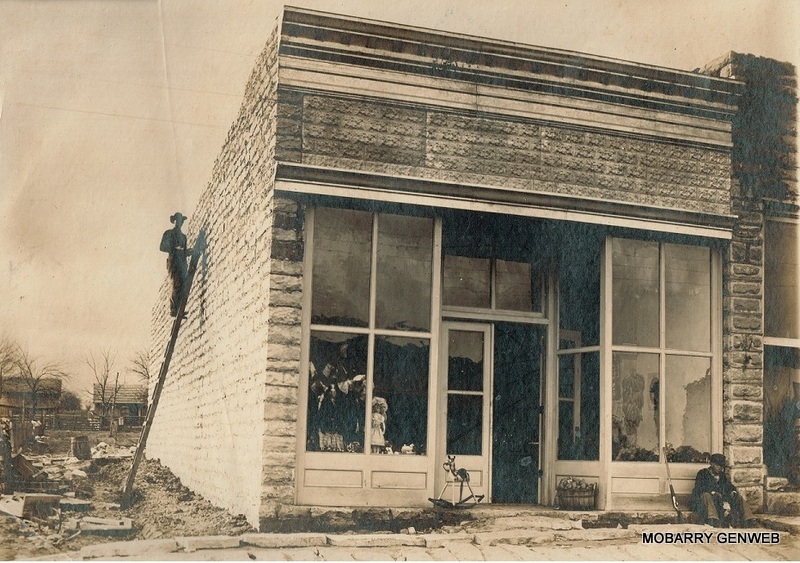 Keetsville Items: T. P. Mooney is improving his hotel for plastering and guttering around it. May 29, 1890, Cassville Republican - Washburn News: The new mill is about ready for machinery. Cassville Republican, Jan 2, 1896 - Research Note: This was probably the Westmoreland Mill, it was just down the road from where Jeff Berryhill was living and is marked on the map in 1909. Cassville Republican, Thursday, Jan 31, 1901: Washburn News: Jamie Mooney is build a new house on the land he bought from Dr. Northcutt. Cassville Republican, Thursday, November 28, 1901: Washburn News: J. Mooney and Ethel Henry have bought the Henbest store or rather the stock of goods. 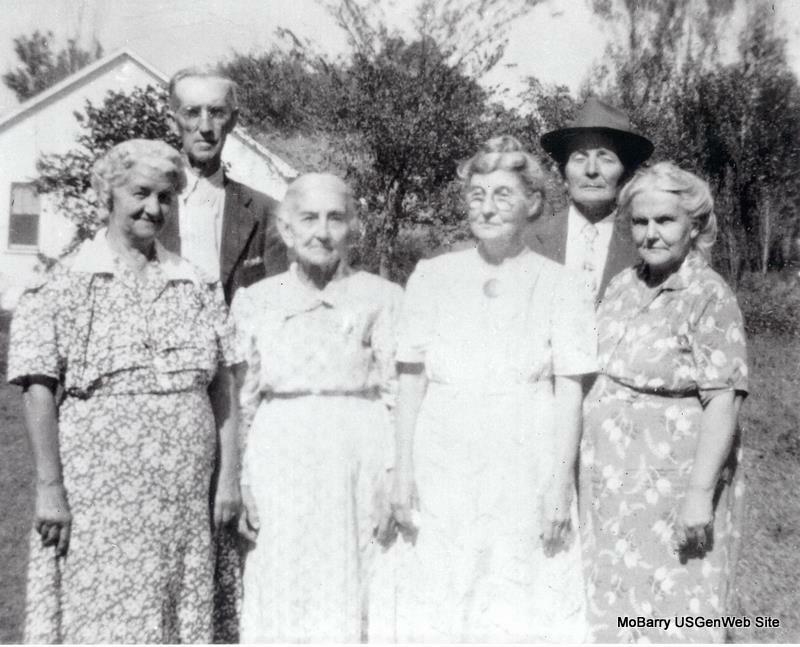 May 30, 1903, Saturday, Cassville Democrat: Washburn Items: Mrs. T. P. Mooney and Mrs. Chas. Taylor attended the Monett carnival Tuesday. Jas. Mooney, John Williams, and Roy Westfall went to Sapulpa, I. T., last Tuesday to seek a fortune. Oct 24, 1903, Saturday, Cassville Democrat: Washburn News Items: Jim Mooney is at Chanute, Kansas with the Woodruff boys. They all have employment at good wages. February 22, 1912, Thursday, Cassville Republican - T. P. Mooney died at his home in Carthage Sunday and was buried at Washburn Monday. 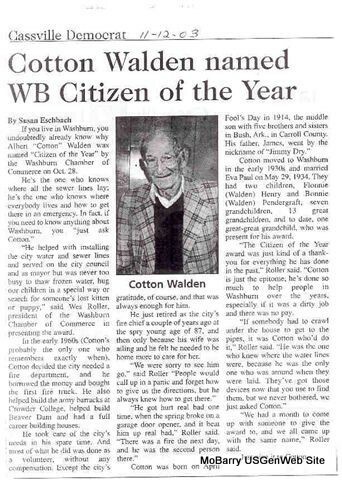 He was for many years a citizen of this county and a merchant at Washburn. He was a good business man and an excellent citizen. Afew years ago he moved to Carthage where he has since made his home. J. H. Mooney, a business man at Washburn, is an adopted sonof T. P. Mooney's. February 22, 1912, Thursday, Cassville Republican - Washburn Prairie News: T. P. Mooney of Carthage was buried at this place Monday. He lived at Washburn until about three years ago when they moved to Carthage. The bereaved have our sympathy. William Bragg Adcock, leaning against the wall - wearing a white shirt. In 1900 John D. Kennedy was the station agent, and his cousin Michael Kennedy was working there. 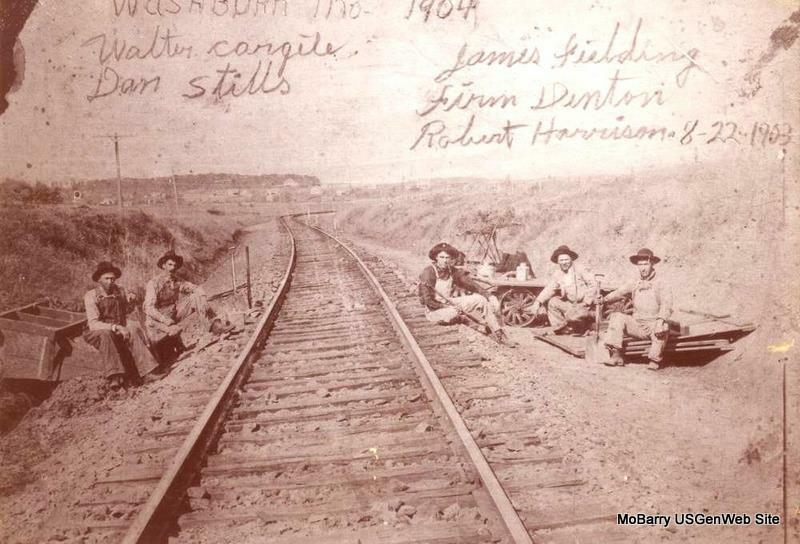 John Kennedy is possibly the man in the railroad attire and his cousin, Michael, may be holding a paper and seated. 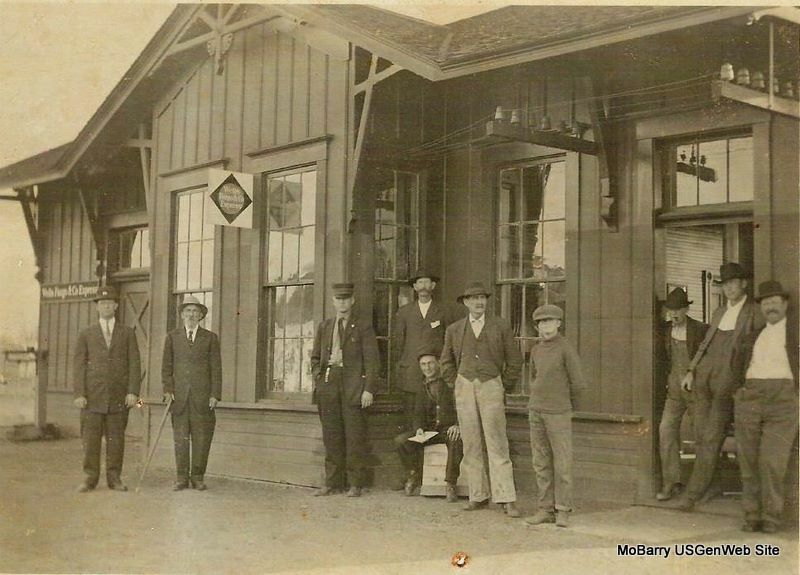 The man with the hands in pockets, hat on, and standing next to a young boy is possibly named Park and the barber. 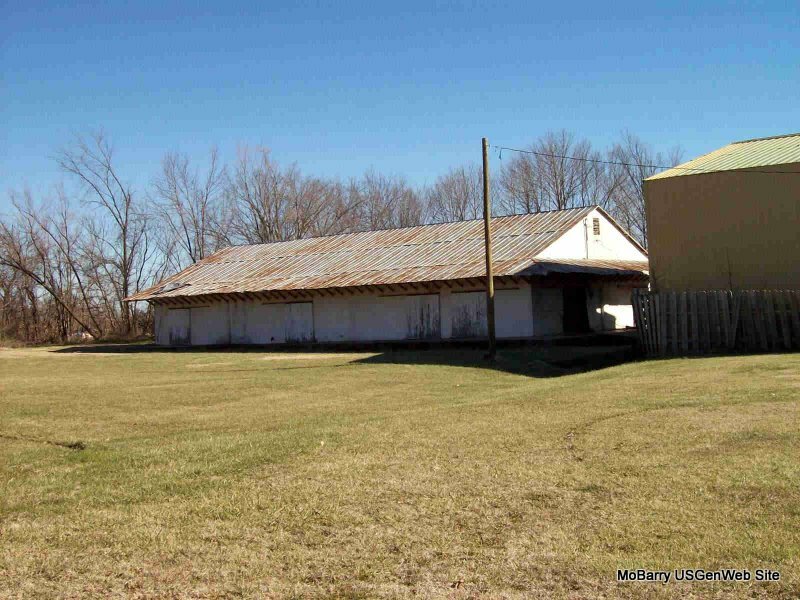 In 1840 Judge Cureton move to Washburn Prairie and bought the location where the town of Washburn is now located. J. T. Keet laid out Keetsville but it was destroyed during the war - (1860 - 1865). 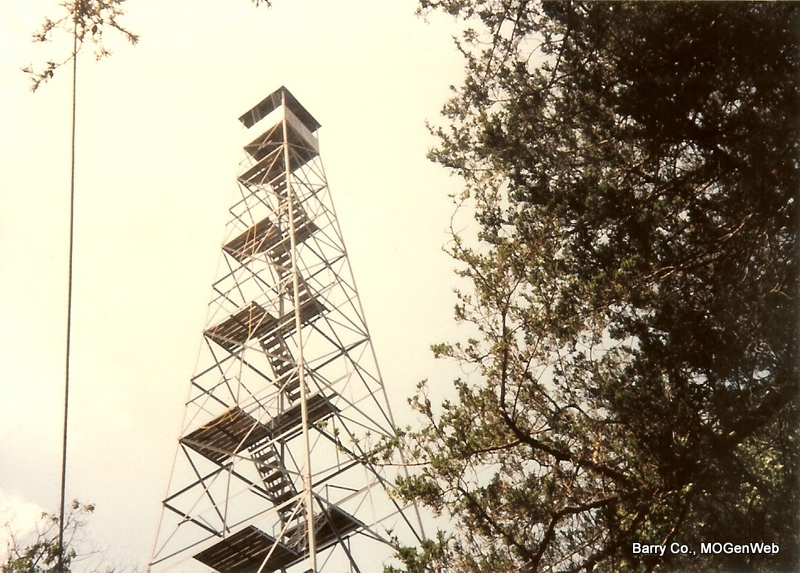 During the years of 1867- 1869 it was rebuilt. 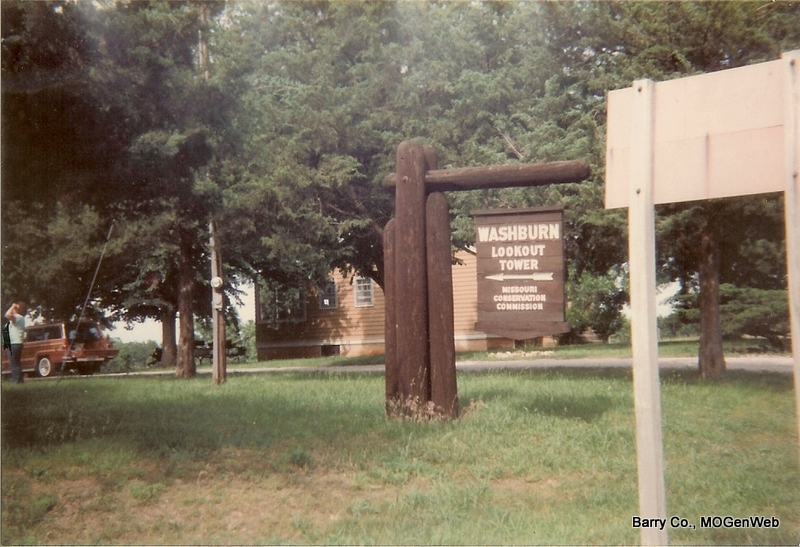 In 1868 a petition was passed to call the town Washburn. It was presented by A. J. Stewart. In 1856 W. B. Adcock came to Washburn. J. T. and James Keet's dwellings and their small store building stood north of the hall building, Dr. Sparkman's residents in 1888. Dr. Clemens and the Withers' blacksmith shops were there later. 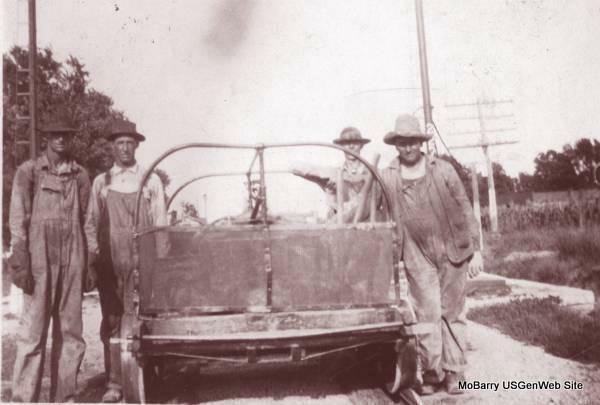 Samuel and Abe Oakley had a blacksmith shop where T. P. Mooney's store later stood. T. P. moved his hotel to O'Day in 1887. One of the hotels that T. P. owned was near where present day Hwy 37 and 90 intersect, behind where Carroll Williams owned a gas station in the 1950's. T. P. Mooney's Hotel stood on the south side of the road near where 90 ends. 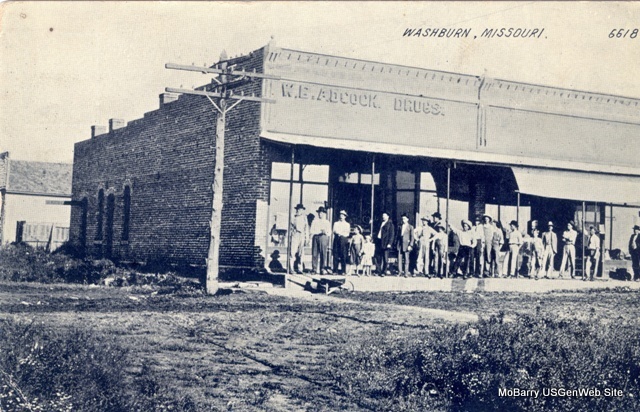 Washburn was incorporated as a town in 1880 by petition of J. M. McClure and others. A. J. Stewart, J. N. Brooks and J. M. Moore were names as trustees. Before that the town was called Keetsville. Washburn was named in honor of Samuel Washburn. Elijah Moore was a general merchant here in the early days and up to about the time of the war. T. P. Mooney and B. F. Windes were hotel proprietors in 1871 in Washburn. 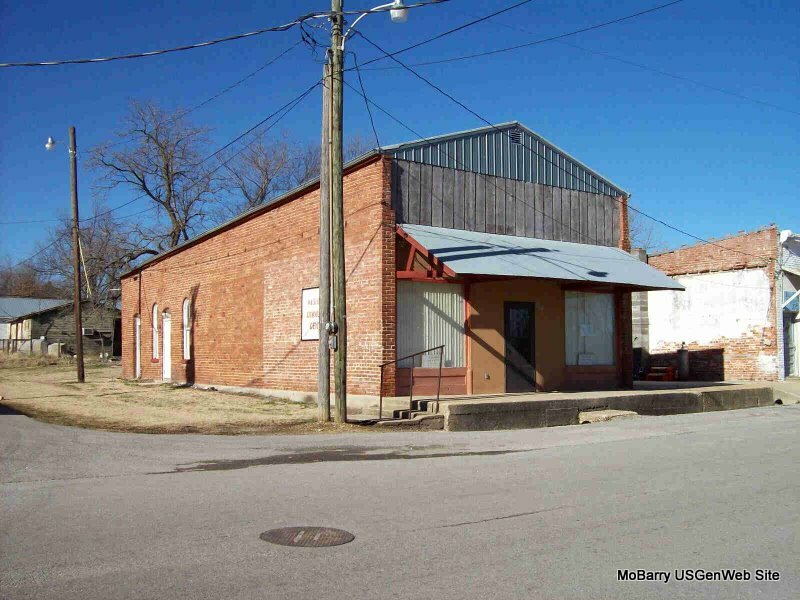 T. P. Mooney, M. S. Inman, B. F. Windes, E. M. Moore's brother and Legg & King were general merchants in Washburn before 1888. Bragg Adcock was a druggist in 1871. William F. Townsend and D. A. Mills were grocers in the 1870's. J. W. Elliott was a silversmith in the 1870's and Blennerhassett & Co. was a hardware store; and H. K. Legg, J. H. McDonald, J. Plummer, and J. W. Eggleston were early day doctors. Around the turn of the century Dr. Leon Blum Northcutt practiced medicine in Washburn and the surrounding area. 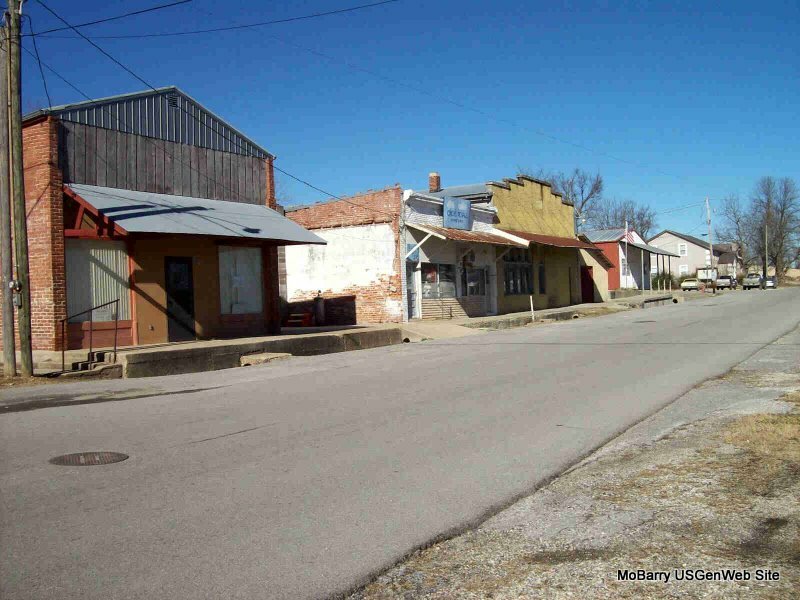 In 1872, Washburn had 200 to 300 inhabitants, six general stores, three drug stores, a stove and tin store, three hotels, a boot shop, a jewelry store, and a school. At that time Mr. Geyer was the principal at the school. In 1880 the population was 575. There were several businesses. Among those were Berryhill & Dunham Nursery - J. D. Berryhill, J. Devereaux, Felker & Bayless, Inmon & Legg, J. T. Johnson & Co., McClure & Good - general stores, W. B. Adcock, Jesse King, R. A. Houston and M. H. Jeffries, druggist. Mrs. A. Foster and T. P. Mooney had the hotels. Daniel Ash and D. B. Bradley were the millers. Inmon & Reece's flour mill, Moore and Salmon's saw mill, W.B. Adcock and W. S. Hurst and Company ran the saloons. R. A. Houston and Pocock & Frost were the grocers. Mrs. Evans had a milliner shop. J. C. Thomas was the constable. W. K. Bayless, was the justice of the Peace. W. R. Felker, was a real estate agent. J. W. Eggleston, J. H. McDonald and T. J. Means were the Physicians. S. M. Cozard was an attorney. In 1869 a newspaper was printed in Keetsville, and it was called the "Winger's Journal". Later on Prof. White's "Gazette" had a short term life and was also printed in the prairie village. In 1911 "The Washburn Review" was being printed. It also was a short lived newspaper and was printed in Washburn. 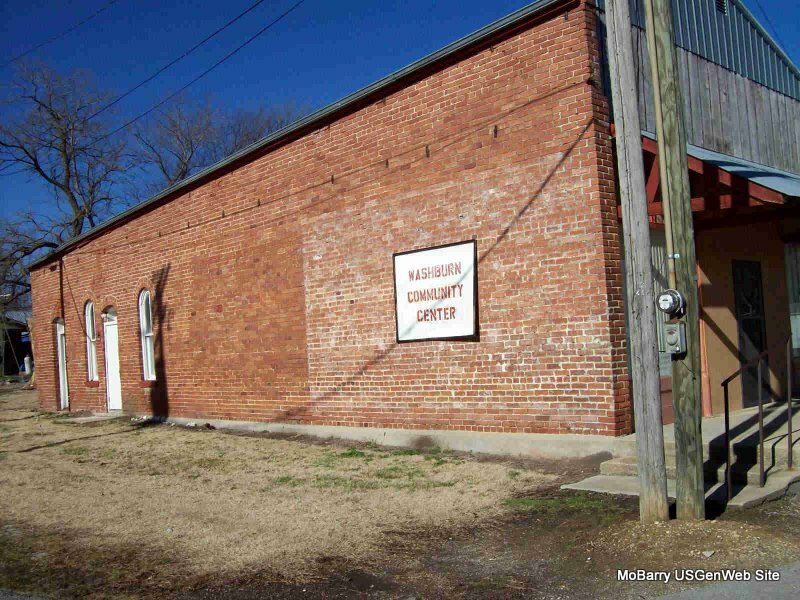 In February of 1860 Joseph G. Peevey was licensed to keep a dram shop in Keetsville. In February of 1873 the dram shop petition W. M. Lassieter, of Washburn, was met by the remonstrance of W. F. Wines, A. J. Johnson, A. J. Stewart, W. E. Frost and others. In 1888, A. A. Johnson and Co., and A. D. Atchison were the general merchants. 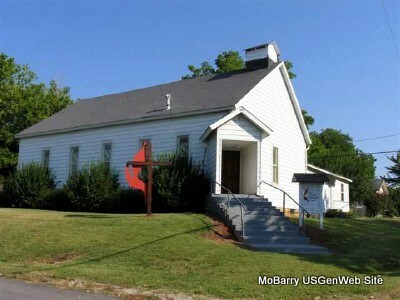 Bigelow and Hale were the blacksmiths, Dr. M. B. Sparkman and Dr. S. W. Chandler were there, Rev. J. N. Brooks was a minister of the Missionary Baptists. In October of 1892, in the Washburn News: T. P. Mooney, Hurst & Reese, W. C. Black, general merchandise. W. T. Denbo, groceries. Chandler & Adcock, drugs were advertising in the paper and also in 1892, East Washburn News: Windes and Co., general merchandise, A. D. Erickson?, were listed as groceries. Cassville Republican, Thursday, October 13, 1892 - W. T. Denbo was married to a niece of T. P. Mooney's. Wesley Talbert Denbo married Ida Edens about 1889 and then in 1896 he married Jennie Mooney, daughter of Shawn and Bittie Mooney. They moved to Miami, Indian Territory and had a grocery store there about 1898. 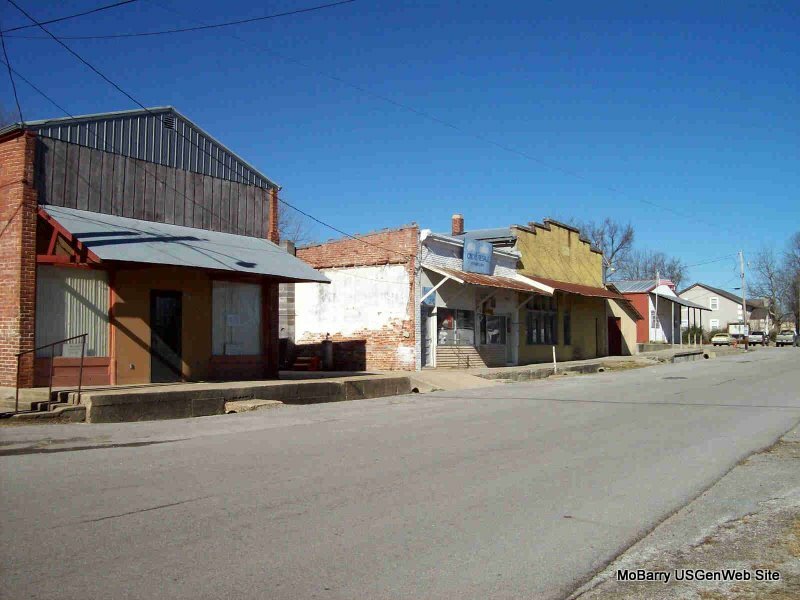 Around 1898 James Pease had a saddle and harness shop, and at that time sold out and moved to Miami, Indian Territory, and according to the Cassville Republican, he returned to Washburn in 1899. His new son-in-law, Jamie Mooney and his daughter Ella had gone there and married and were working with the Denbos to run a grocery store. Washburn News: The new mill is about ready for machinery. Cassville Republican, Jan 2, 1896 - Research Note: This was probably the Westmoreland Mill, it was just down the road from where Jeff Berryhill was living and is marked on the map in 1909 as a mill. 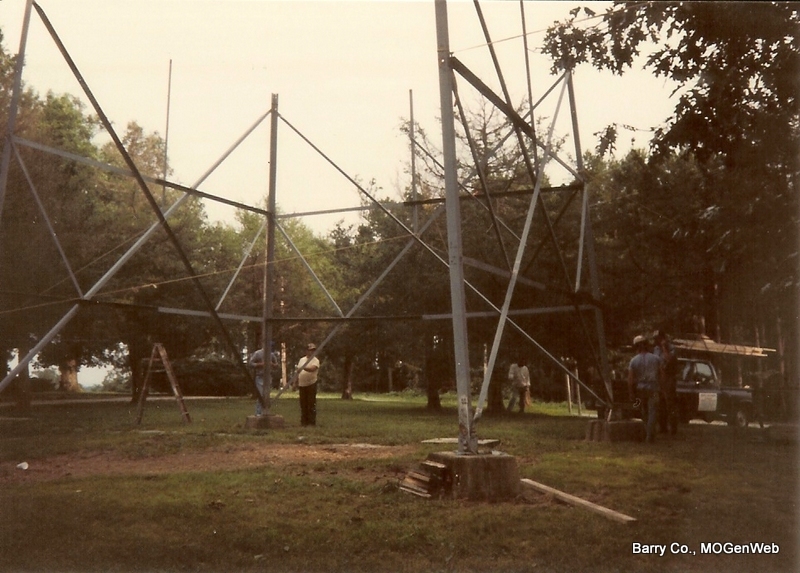 Jeff had the Berryhill Nursery at that time. 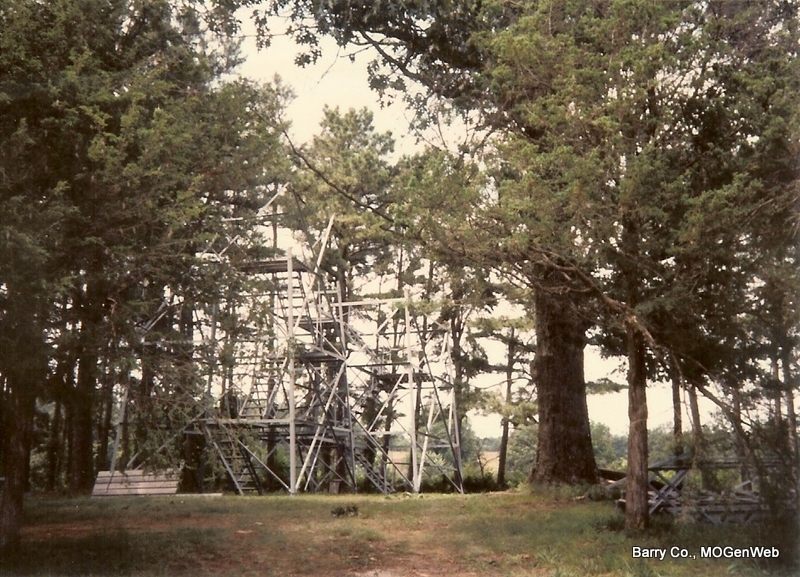 In 1909 the Westmoreland Mill was geared up for operation. Cassville Democrat and Goodspeed's History, pub. 1888. 1 mile south of Washburn. 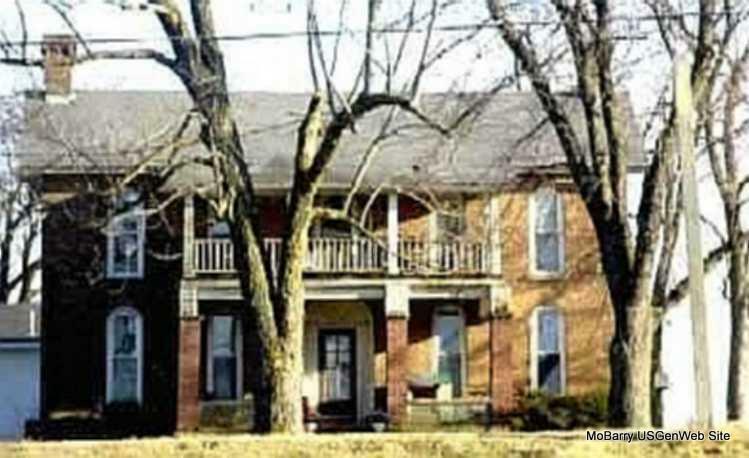 The John G. Harbin home, one mile south of Washburn, was the last stage stop in Missouri before entering Arkansas for the Butterfield State Coach mail route. Itwas the I. B. Davis farm on the 1909 plat map. 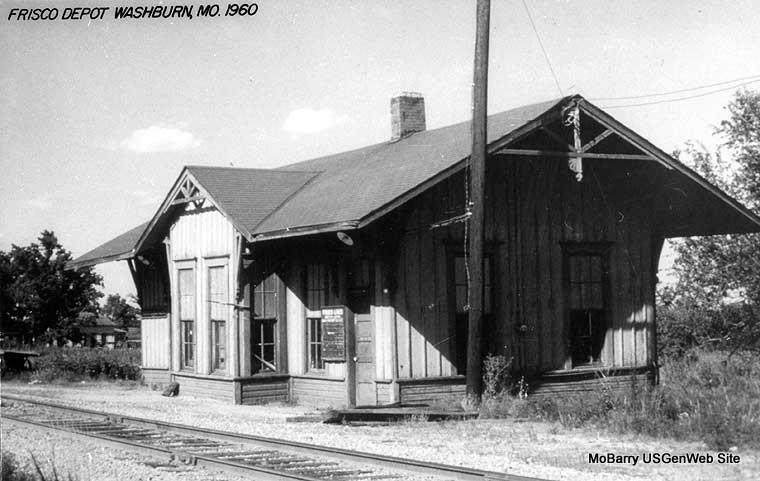 John G. Harbin was the original station - keeper and the stop was 15 miles SW of Crouch’s and 6 miles north of the Missouri Arkansas line. 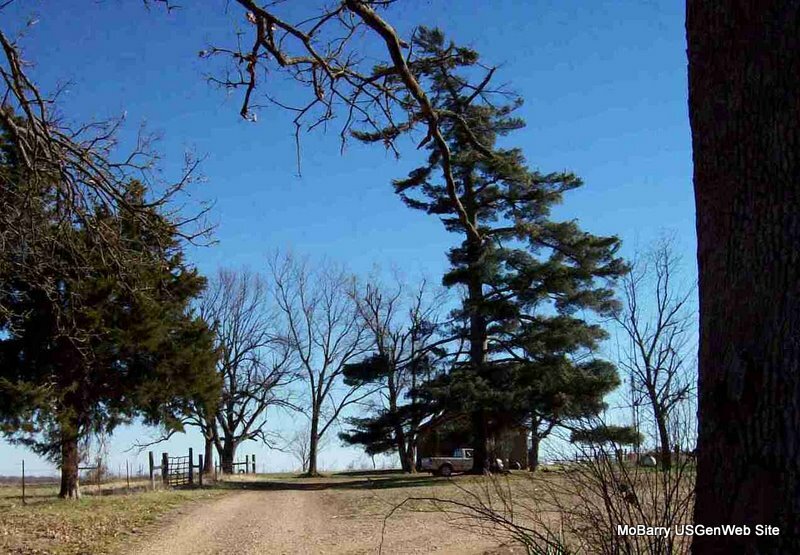 The house was a two-story double log home that stood a mile SW of Washburn and was burned during Civil War. 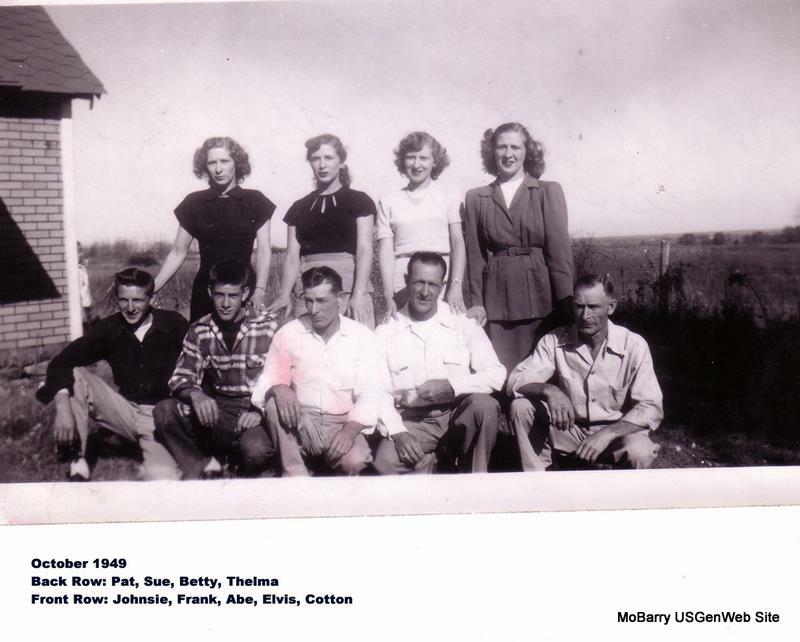 A modern house stood there in the 1930’s and it was occupied by Mrs. S. L. Davis and is in the photo below. The mail road approximates Highway 37 but ran slightly east of 37. The mail road ran 25 feet east of the house. Hwy 37 was established west of property isolating it from the flow of traffic. The mail road continued south along the east side of 37 about another mile and then meets up with county road (1050) and goes south by Rock Springs school and church and on to the Elk Horn Tavern. John G. Harbin and W. E. Frost acquired this land in 1857. 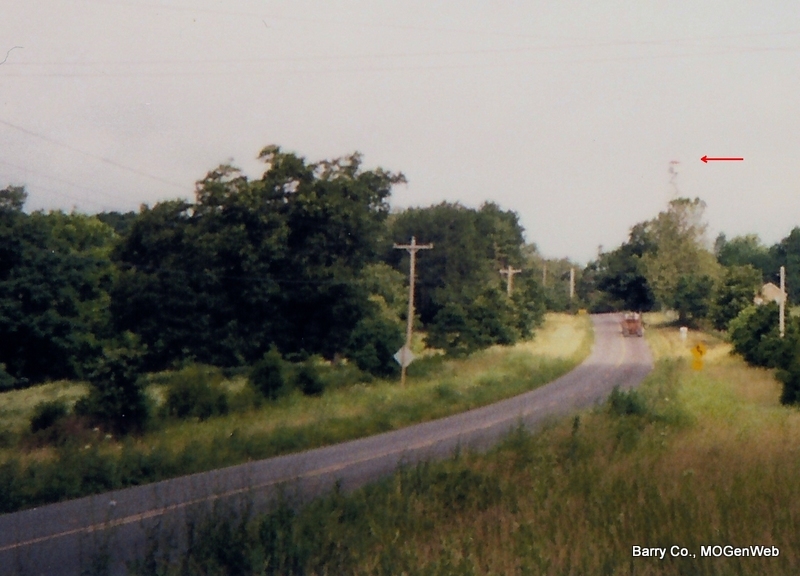 The highway that runs in front of the New England salt box house - the Weathers house - was once known as "The Great Highway", Wire Road, and was a Butterfield Coach road and an Indian trace. It was called "The Great Highway" because of large number of immigrants using the route to go west. Because of the use of bricks and the architecture, the house it is known that it was probably built during that time. 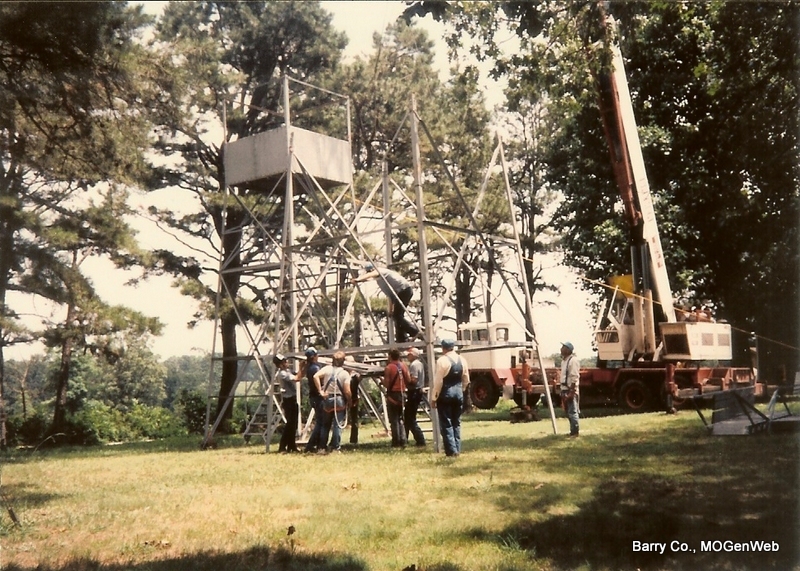 Big Springs Canning Factory at Big Springs community on Greasy Creek, approximately six miles SW of Washburn, MO. The factory was built shortly after WWI between 1919 and 1920 by Edlie Weathers and Elmer Edens for the Rush Canning Company. Doc Eggleston was running the factory. Inmon & Reece Mill - In 1880 Daniel Ash and D. B. Bradley were the millers. Inmon & Reece had a flour mill and Moore and Salmon had the saw mill. Westmoreland Mill - Washburn News: The new mill is about ready for machinery. Cassville Republican, Jan 2, 1896 - Research Note: This was probably the Westmoreland Mill, it was just down the road from where Jeff Berryhill was living and is marked on the map in 1909 as a mill. 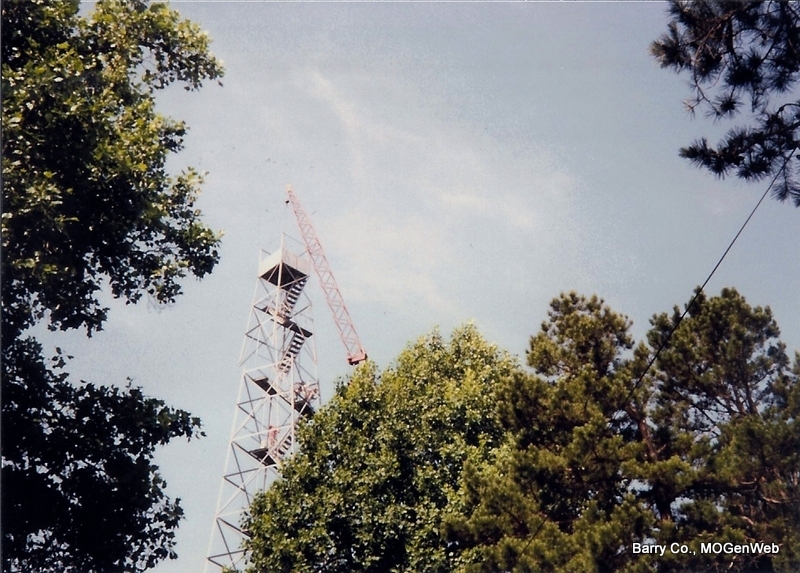 Jeff had the Berryhill Nursery at that time. 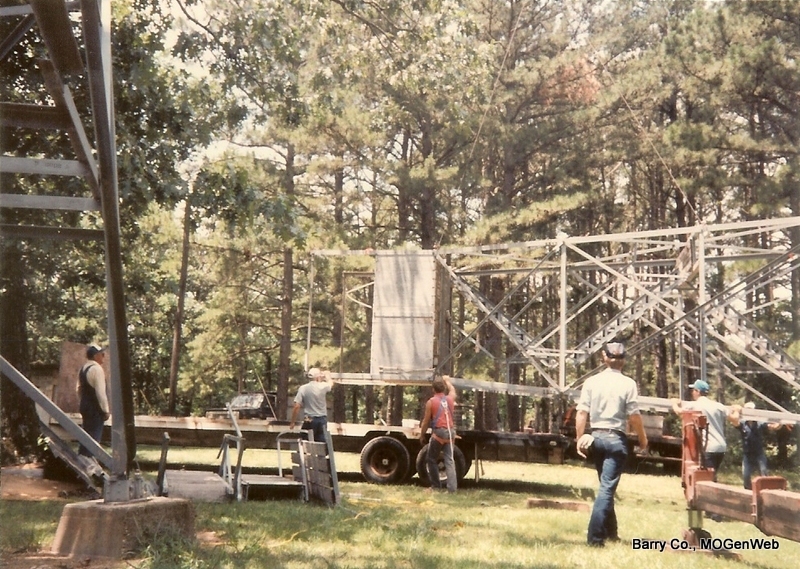 Jeff's daughter, Ruth, remembered her father going to the mill and using it for his personal and family needs. In 1909 the Westmoreland Mill was geared up for operation. Newspaper account. The men are Walter Cargile, Don Stills, James Fielding, Firm Denton and Robert Harrison. Robert Harrison was the son of Robert Austin and Louisa Baker Harrison. 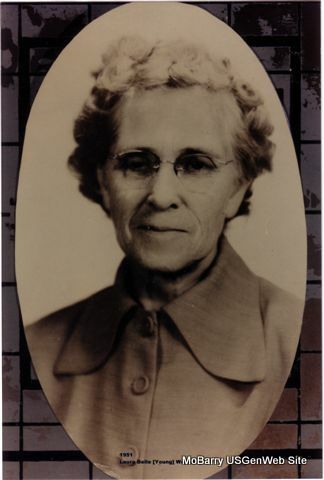 Louisa Baker Harrison married 2nd time to James Thomas Cargile and is buried in the Cargile Cemetery in Washburn, MO. 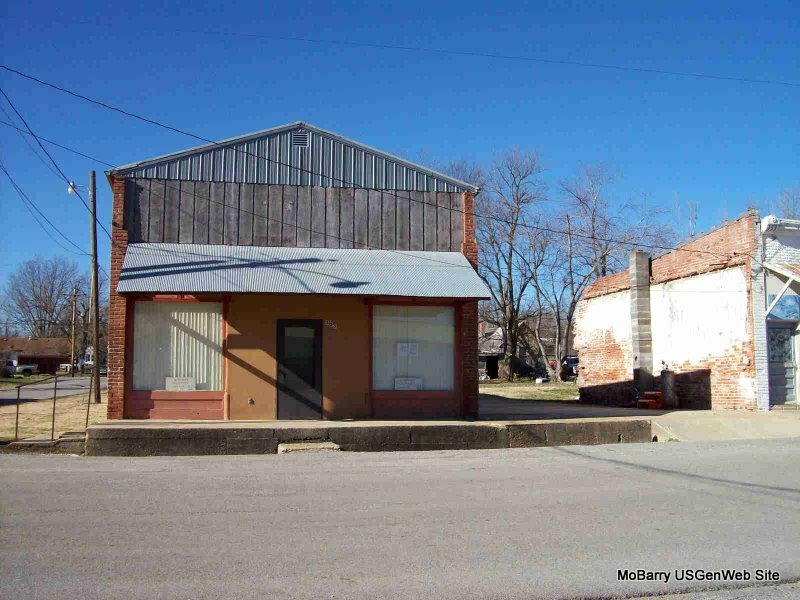 Old Store Building - Now a Community Center. 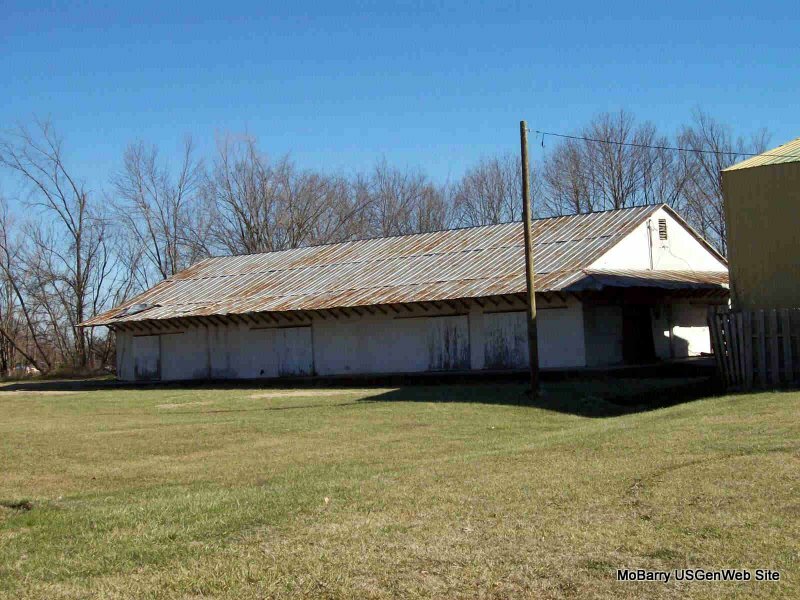 Side View of Community Center - Old Store Building. This may be the oldest building in Washburn. Another View - At one time the back doors that are seen in this photo led to the post office, which was in the back of this building. Old Lodge Building - Built in the 1800's. 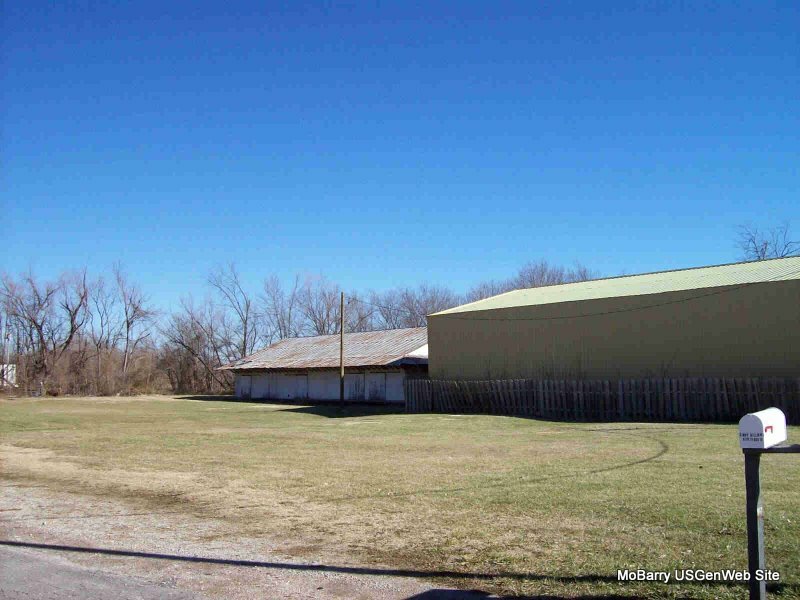 Old Tomato Canning Factory - Yellow Building is where Frisco Depot was located. 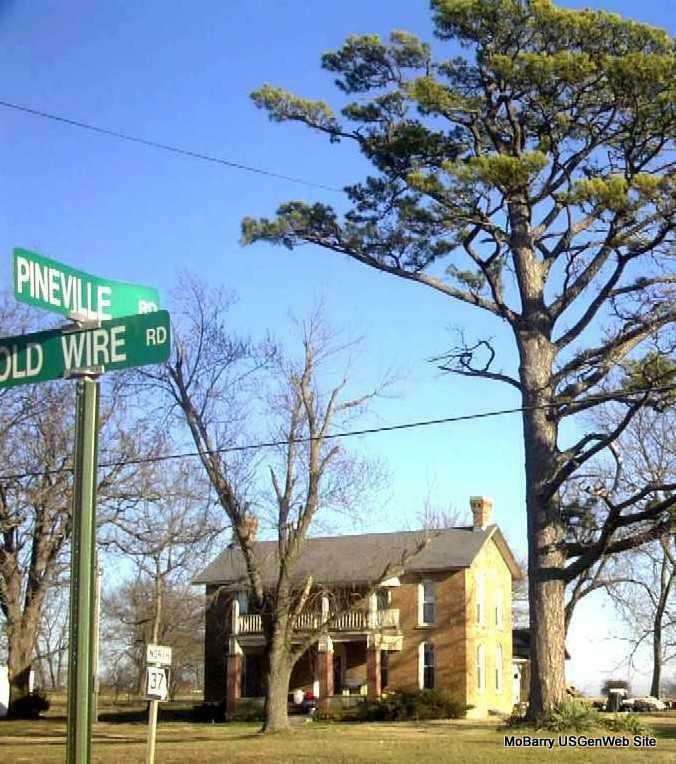 Pine was planted by Jefferson Davis Berryhill around 1900 where Berryhill Nursery was located. Layton & Lora (Still) Pippin - Md. 50 Yrs. Usually considered a Rock Springs family and sometimes a Seligman family. 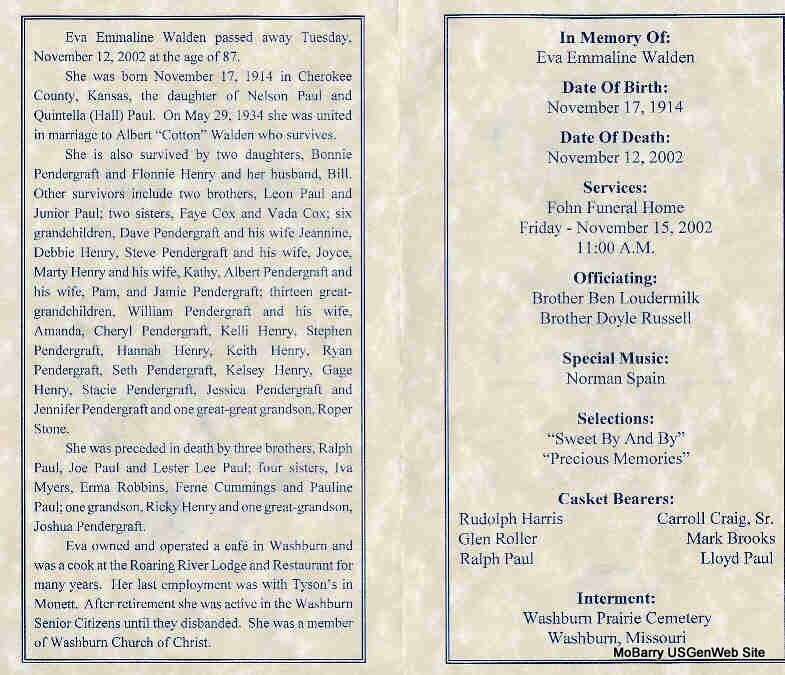 Wm Moulton & Gertrude (Thomas) Varner - Md. 70Yrs. 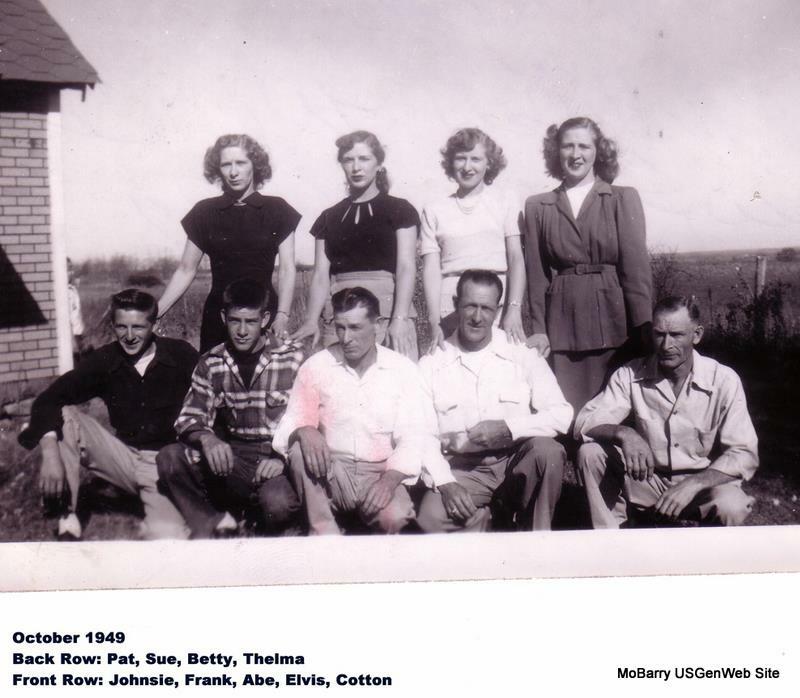 Submitted by: Paul Ernest Jackson, Sr.
back row: Everett Harry "Johnsie", Franklin Delano "Frank", Clovie Abe "Abe", Elvis, and Albert Forest "Cotton"
front row: Mary Alene "Pat", Norma Lee "Sue", Betty Jo "Betty", and Thelma Deloris "Thelma"